65" long to reach around the entire guitar, with smooth edges for close size tolerances. This is the right cream color for Gibson® guitars. ABS plastic bindings are used by Gibson®, Martin®, Taylor®, Fender® and others. The material adheres well to wood and to itself. Our ABS bindings are 65" long — a single piece will reach completely around a guitar body. They're made with smooth edges, not rough-sawn from sheets, for close size tolerances. #4397 extra-tall .565" cream binding is the right size and color for Gibson® Les Paul® Guitar tops. To laminate bindings, you can sandwich them using our Binding Laminator and acetone. Measure carefully before you rout the channels, and almost any combination can be installed. C uses .020" white and .020" black, installed sideways as edge trim. 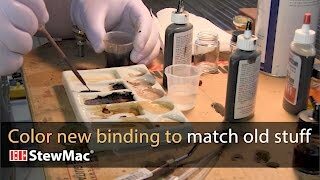 For easy installation, we recommend StewMac Bind-ALL Guitar Binding Glue. Binding tape or rubber clamping bands will hold the bindings in place while the glue dries. 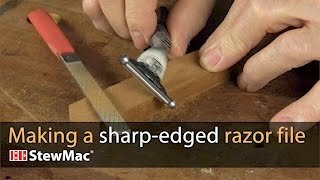 Use a scraper blade to trim the glued bindings flush to the surrounding wood. There have always been slight variations in the color of the cream plastic parts used on Gibson and other guitars. It's not uncommon to see brand new and vintage guitars with bindings, pickup rings, toggle switch rings and pickguards that don't perfectly match in color. We do our best to match all our cream products, but there's no absolute control from batch to batch, or from supplier to supplier. We've watched Dan Erlewine repair this 1930s Kay over the previous 3 Trade Secrets. It's time to finish it up. Elliot John-Conry of EJC Guitars ages Dan's patch of new plastic binding so it blends in with the old binding around it. About the guitar in this video: This 1930s Kay Deluxe is a fixer-upper that Dan Erlewine repaired in order to sell. Now that it's in great shape again, maybe Dan'll keep it! 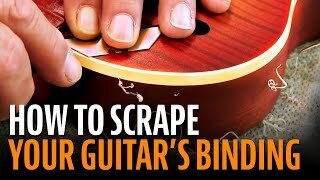 Scraping for sharp looking binding: here's how it's done! The king of Gibson relic finishes: Tom Murphy is well known as Gibson's go-to guy for relic finishes: perfectly worn and age-cracked. Tom's business, Guitar Preservation, makes this a specialty. In this week's Trade Secret he shows us how to make and use a scraper for cleaning binding after spraying a sunburst. Bad news: the binding on this old Gibson is crumbling to bits. Worse news:that binding is the only thing holding the body together! Dan Erlewine's plan is to replace the binding bit-by-bit, so the top doesn't fall off. By grinding a new edge on a razor file, he creates a tool for cutting crisp square binding channels without a router. Overview of binding, purfling, and other instrument trim, including binding recommendations and installation techniques. Perfect for your LP build. Binding makes the difference and this is ideal for restoring or building a LP or other arch top. Measured with a micrometer, this binding measured .095", not .090" so you should be prepared for a little extra scraping. Easy to work with.Heats up well and doesn't become brittle.Nice quality binding. First purchase from stewmac. Product arrived in 2 days. Quicker than I expected. All items exactly as shown on the site and well packed. No need for binding arbitration with this stuff! I had a customer ship me his flood damaged 2013 Gibson Rosso Corsa Slash Les Paul for repair. A friend of his had stripped the finish and pretty much melted all of the body binding and some of the fretboard binding as well. After assessing the damage and removing the melted binding, I ordered some cream binding from StewMac for the body and the neck. As always, it was a great product and easy to use. It didn't match the existing binding very well. I had intended to splice onto the existing fretboard binding instead of replacing all of it but no biggie. Hands down my go to place for all builds and replacement parts. These bindings are a perfect cream color. Great service and promotion shipping with these guys up here at stewmac! Thanks again everyone for providing such a great experience purchasing with you! This was my first attempt at applying binding to a stringed instrument. The binding fit like a glove and required little scraping for a perfect fit to the pre-routed edges of the resonator. I used Stew-Mac's cream color for a vintage look, which matches the neck. Just installed this on my guitar project and very happy with the results. I dipped it in boiling water, quickly wiped it with a paper towel and bent it to correct shape. Doing it this way in several passes you can shape it with no risk of drooping or melting. I didn't even find it necessary to wear gloves. Very easy to work with. Les Paul® is a registered trademark of Gibson Guitar Corporation.